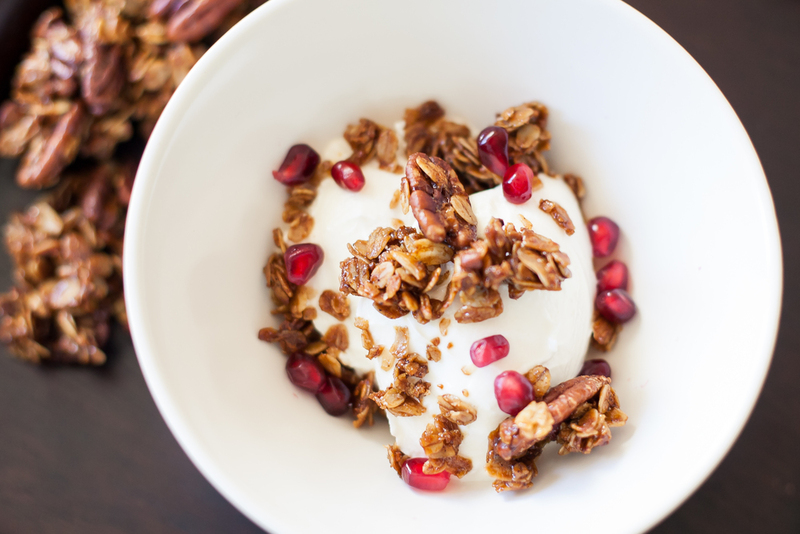 Granola is a staple in my home. I throw together a batch every week for the pantry. It's enjoyed over yogurt or ricotta, and sometimes just by the handful. Every batch is different, depending on what I have on hand to toss in. Sometimes dried fruit, sometimes flax, maybe even coconut. But what remains the same is the basic recipe ratios. Once you have one that you like, experiment away with flavors and mix-ins! This season I have been on the hunt for the ultimate gingerbread spice blend. I wanted to make my own and it had to be spicy, and earthy and most of all, beguiling. After a long search I finally asked the friend that I should have asked first -- the amazing Kelly Cline. I was beyond excited that she shared her recipe for Kelly's Kick Your Holiday Arse Spicy Gingerbread Spice with me. I had all the ingredients on hand and crushed, blended and found myself with exactly what I was looking for. The husband could even smell it from the garage and came in to see what I was up to. Beguiling achieved. Next I started to assemble the parts of granola. This goal for this particular recipe was to be a warming blend of spice and sweet. I kept the ingredients very simple - but feel free to experiment at will. Bake on a sheet lined with parchment for 45-50 min, stirring every 10 min. When it comes out of the oven it will still be gooey and melty. 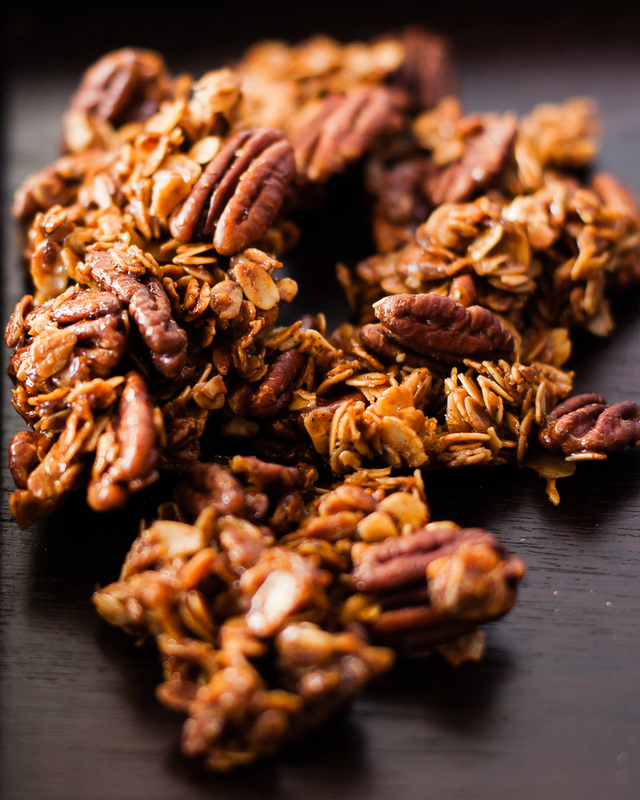 For chunky granola, don't stir while cooling. Once it's cool, break it up and store in an airtight container and enjoy! Ok, so I do toast the ground spices. I lay them on a sheet pan on parchment and pop them in to a preheated 400 degree oven for just a couple of minutes. Like 1 or 2 minutes tops. Just until they are warmed. Then I just gather up the parchment and dump the whole lot in to my spice grinder, and I give it a couple of pulses. This gets all the spices a little more co-mingled and uniform in size. Let it cool completely, and then jar it up. It scales up really good too. The key to the spicy is that cayenne. Not so much that you are dumping gallons of dairy down your throat trying to squash the pain. But it's enough in there that it will leave a very pleasant warming sensation on the middle of your tongue. When you make your dough/batter for your gingerbread - taste it before it bakes. Give it a second and see if it kicks (it will) but if you want more kick, pinch in a little more cayenne. Just remember, as the cake or cookies sit, the cayenne will increase a little in intensity, so aim for a heat (when tasting) that is just below where you want it to be.